First, I die cut a piece of Simon's 120 lb White Cardstock using one of the rectangles from Simon's Stitched Rectangles Dies and then with Simon's You Are My Favorite Die. I then cut a piece of Slate Gray Cardstock slightly larger than this panel. I used the large flower and leaves from Simon's Handwritten Floral Greetings Stamps along with my Misti Stamping Tool to first stamp the images on the Slate Gray Cardstock with the Slate Hybrid Ink. Next, I positioned the die cut panel and re-stamped the images using the Goldenlocks Hybrid Ink. I adhered the white panel over the slate cardstock so that the images lined up. I added a few stamped dots from the Handwritten Floral Greetings Stamp Set and adhered the finished panel to a card base created from Simon's Lemon Chiffon Cardstock. This is a lovely stamp! and I want those mini inks! What a great card!! 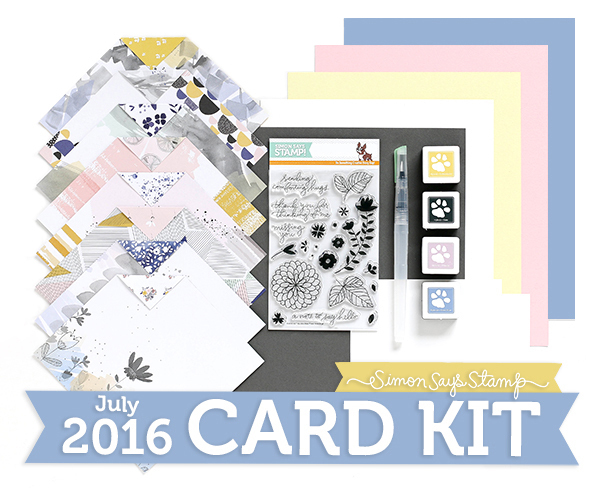 This is such a pretty kit - love the different ways I've been seeing everyone use it! Very, very pretty! You'r right about the color palette and the sweet stamp set! Love it all!! love the subtle yellow pattern in the background. just lovely! The color pallet it so nice with this kit. I really like your card and how you highlighted the die cut. I love your clean card. The kit looks fabulous. Thanks for a chance to win one! Love the layers with the flowers and the letters. Such a nice clean & simple card ! 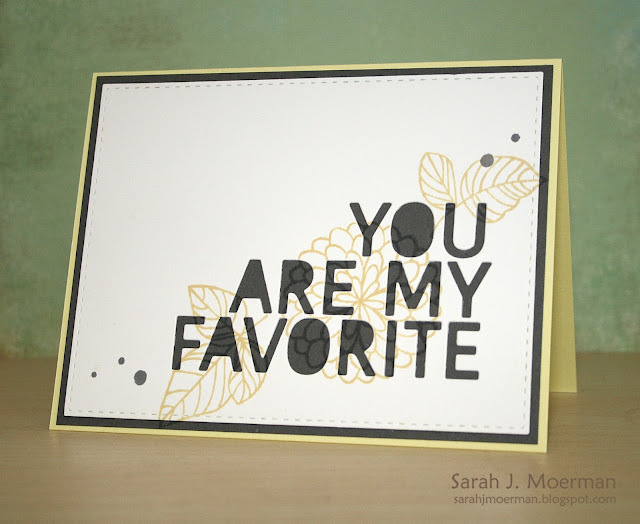 Sarah your cards are always my favorite! I love your beautiful style! Wonderful card! This looks like another great kit. Your card is gorgeous. Love the colours in this kit. Thanks for sharing. What a great idea for a card! I really like this Stamp set and the colors in this SSS kit. It's so great that they included several of the inks. Would love for them to do this more often! Sarah, your card is so delicate and pretty! Your card design is so pretty. This is a great stamp set in a beautiful kit. Love that die so much, the font is gorgeous and really like how you incorporated the flower images too. This is such a pretty kit and really like the stamp set!! Gorgeous! I love the darker use in the negative area! Cool design! I love how the floral pattern is continuous from the cream cardstock to the gray. Thanks for the chance to win! I think this is my favorite kit SSS has released so far. Sarah, this card is very beautiful and sweet. I love the diecut sentiment. That stamp set is just beautiful!!! Love the versatility!! I love the Elegant simplicity of this card! I can see these stamps are a must have! Love your card, the ink cubes and papers. I love the colors and stamp set in this kit as well. Your card layout is unique; I will have to try it on one of my cards. Thanks for the opportunity and the inspiration. This is a great design...love how you stamped the line images and then cut out the die cut words.